Telley Lynnette Gadson introduces readers to some of the women and men from her journey. She does this to represent the culture, heritage, and history of the legacy of black prolific expression from the pulpit to the pew, from the altar to the alley, and from the pastor's study to the parking lot. Her message is whatever you do, whatever you go through, whatever you experience, don't forget who you are. This February, make African American History Month into something even more than a time to increase knowledge and foster pride of African American history. Use it as an occasion to strengthen personal and communal faith, hope, and commitment to a rich heritage and future with this daily devotional specifically created for use during African American History Month. 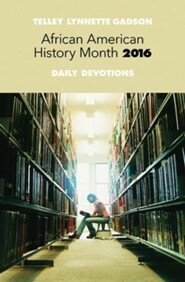 Each day you'll be inspired and encouraged whether you use the devotions for personal reflection or in group studies. The devotions are also perfect to use in opening meditations for meeting and events. Telley Lynnette Gadson is an elder in full connection in The United Methodist Church. A graduate of the University of South Carolina and Candler School of Theology at Emory University, she has spoken and preached at events and worship services throughout the country. She serves as Senior Pastor of Saint Mark and Saint Matthew United Methodist Churches in Taylors/Greenville, South Carolina. I'm the author/artist and I want to review African American History Month Daily Devotions 2016 - eBook.